Simon Wong, co-founder of Singapore Sidecars and its parent company Triquetra. When British-born Hong Konger Simon Wong came across a pair of beautifully restored vintage Vespa sidecars outside a Singapore shophouse seven years ago, he was instantly smitten. The branding professional approached owner and sidecar maker Johnny Chen and offered to buy them on the spot. So began a friendship that reached a watershed moment in 2015, when the pair set out to raise money for cancer research in memory of Wong’s late wife. Together, they parked seven Vespa sidecars on Orchard Road during a car-free day and invited passersby to make donations in exchange for a photo. “We thought nobody would come,” Wong recalls. But they did. Elderly Chinese aunties, tourists from New Zealand, local teenagers, business executives in suits—all swarmed around the sidecars for selfies and Instagram photos. Some asked for the price of a ride and others enquired about a tour, which was how the idea for Singapore Sidecars was born. Though Chen and Wong soft-launched parent tour company Triquetra last August, it wasn’t until March that Singapore Sidecars really came into its own, operating a fleet of 10 sidecars and scooters piloted by freelance drivers. Some of the older vehicles have been around as long as modern Singapore, and were made at the local Vespa factory before the city-state’s independence in 1965. I learn much of this while visiting from Bangalore with my octogenarian parents on a two-hour heritage ride through the Civic District and the atmospheric neighborhood of Kampong Glam. 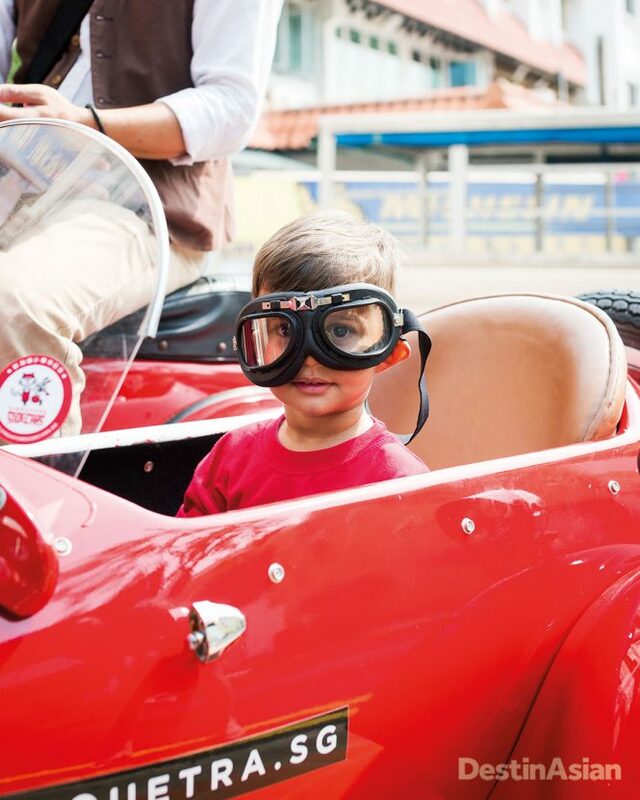 Riding a Vespa sidecar can be fun for passengers of all ages. I am hoping to give mom and dad the chance to live out a scene from the 1975 Bollywood flick Sholay, in which the two heroes sing along while riding a sidecar, but rain greets us on the day of the tour. They sensibly opt to ride shotgun in the backup jeep driven by Wong, leaving me the sole sidecar rider. Sitting in one, it turns out, is easier than it looks. I stretch my feet out in front and scrunch down inside. Once I am fitted with a helmet and goggles, we take off with a jolt, racing down the rain-slicked streets and whizzing past landmarks like the durian-shaped performing arts center on Marina Bay, the National Gallery, and the Fullerton Hotel. It is unusual to see them from a vantage point this low to the ground, the only disadvantage being the petrol fumes wafting into my nose. I have come here as a tourist, but now the tables are turned. At street corners and traffic signals, local Singaporeans smile and wave at me. “Photo, lah,” they say, before taking selfies with my sidecar. When we stop at a traditional tea shop in Arab Street for teh tarik (pulled tea), my parents ham it up. Mom poses for the cameras with panache; dad, being more reserved, leans on his cane and smiles like the retired English professor that he is. Another driver, Yusri Sallim, started Mod Squad Singapore, a group of Vespa and Lambretta enthusiasts whose pimped-out scooters and retro duds hark back to the Mod subculture of 1960s England. Sallim repairs Vespas and rides solo across countries as well. Last April, he joined Wong and Huang on an 800-kilometer charity ride from Singapore to Penang. Next year, they are planning to make their way to Ho Chi Minh City. 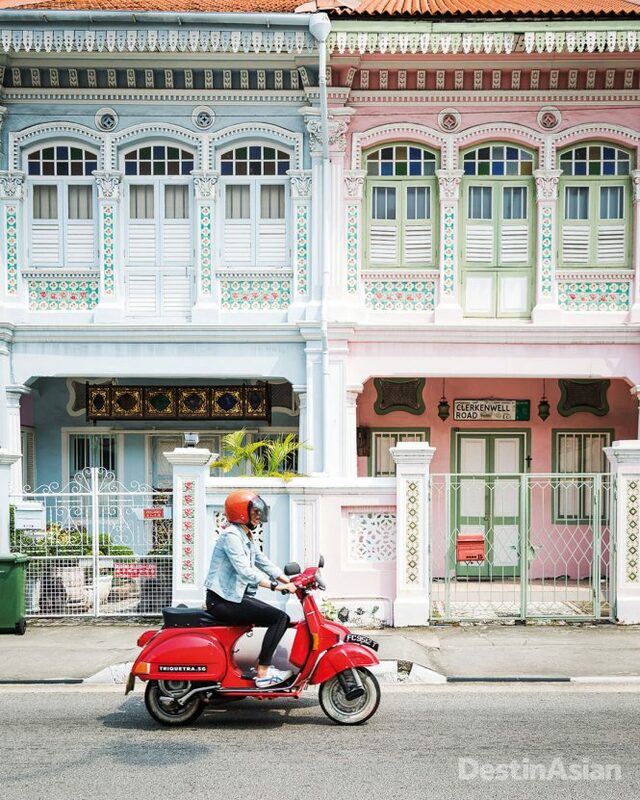 Scooting past a stretch of colorful Peranakan shophouses on Koon Seng Road. Although the rain keeps my parents from getting into a sidecar, they relish stops like Sifr Aromatics, a third-generation perfumery owned by Johari Kazura on Arab Street. Mom considers herself a perfume aficionado, and she’s delighted upon realizing that Kazura speaks Tamil, our native tongue. He recommends trying out his custom-made Baudelaire scent. Eventually, after observing Kazura mix compounds to match her request for something more floral and intense, we walk out with beautifully packed perfumes, two portable head-massagers for my husband, and a load of samples. Then there’s the aforementioned tea shop in Kampong Glam that serves strong, frothy teh tarik. We spend the rest of the tour sipping away and chatting with strangers, exchanging stories about copper urns and Chettinad food, oud and jasmine scents. It’s a heartwarming experience that makes us feel a part of the mixed Malay-Indian community living on Arab Street. After five days of touring the usual sights—Sentosa Island, the zoo, and Marina Bay Sands—we’re utterly charmed by this refreshing and intimate view of the Lion City. This article originally appeared in the October/November 2018 print issue of DestinAsian magazine (“Spin City”).